Photoshop supports a two finger rotate gesture, as well as two finger pinch gesture for zooming, that users accidentally invoke while using the trackpad on their Macbook or Magic Trackpad. You can press the [esc] to reset the document rotation. In Photoshop CS5, you can disable gestures altogether by disabling the "Enable Gestures" preference. Choose Preferences > Interface... and uncheck "Enable Gestures." 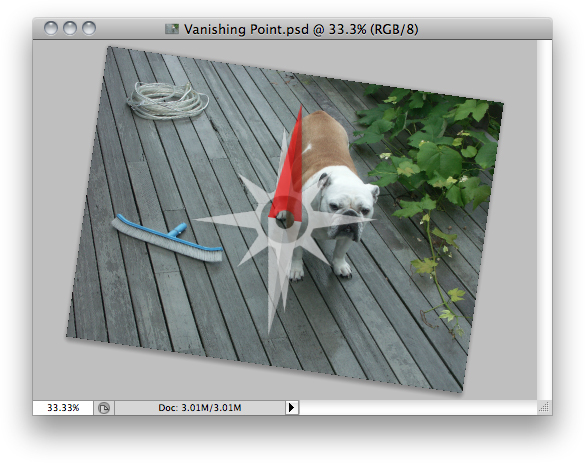 In Photoshop CS4, you can disable gestures altogether by installing the Disable Canvas Rotation Via Trackpad plug-in.